On my jaunt in Atlanta, I happened upon La Mongerie for lunch with my brother. I went to the location in the Midtown – Ponce de Leon area. It’s not a large place, but I found it cozy and welcoming. As the server came by to offer us menus, I immediately ordered a cup of tea as I was chilled and wanted to warm up quickly. Perusing the menu, i liked the sound of their “PLT”. 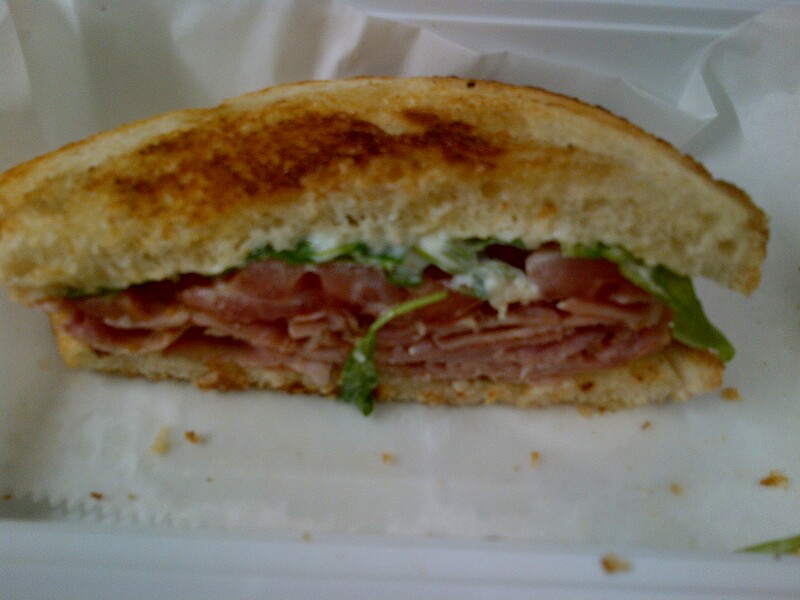 It’s like a BLT but with Prosciutto. We were having a light lunch because we had dinner plans for a big dinner. Of course I ordered my sandwich without the cheese. I really liked the truffle mayo and overall it’s a pretty good sandwich, but the overall experience was a little bit disappointing. The server had to confirm our order twice as he was not sure what we ordered. We were alarmed the second time as we had already been waiting for 30 minutes. There seem to a be a couple of large, very aggressive flies in the restaurant. After 45 minutes with no food in sight, we decided to leave. I found out the table behind us had been waiting for over an hour and they were not pleased. The manager asked us to wait another few minutes. We chose to pay and wait at the counter and take our food to go. That took another 15 minutes and the other table still did not have their meal served. The manager was kind enough to give us our meal complimentary with a bag of chips but we later realized the chips had expired. I’m not sure if this was just an off day for the restaurant, but I hope if I dine there again there things would run a bit more smoothly.